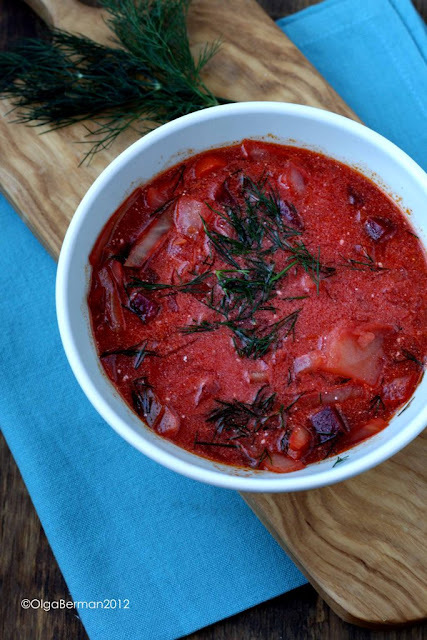 I've made borsch several times, so why blog about it again? Well, I have a good reason. 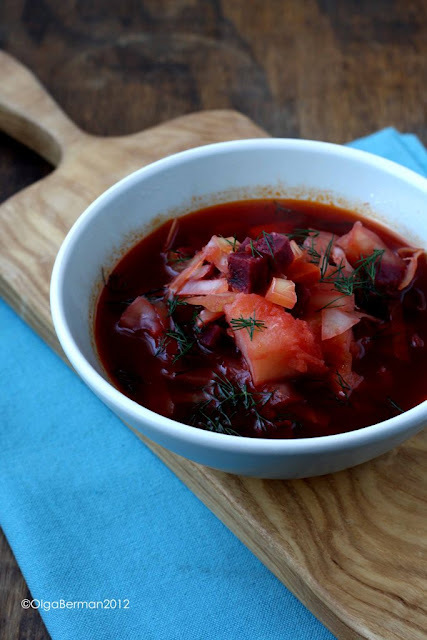 I was asked to do a demonstration on how to make borsch at the Jewish Museum of Maryland! Of course I'm slightly terrified, but I also think it will be a blast. If you are able to attend the event, I would love to see you there. If you can't, do me a favor and make this recipe and let me know how it turned out. 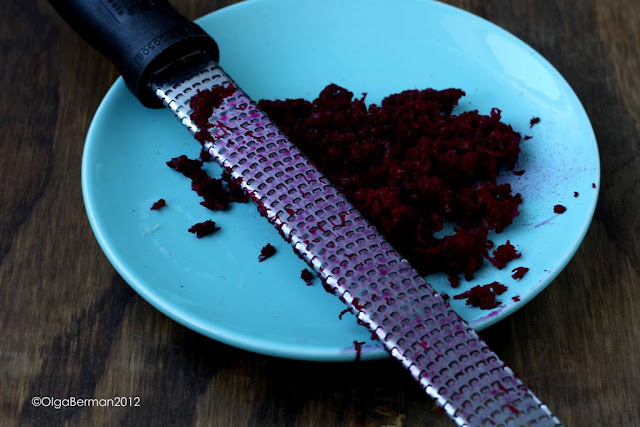 Also, this blog post will be part of my new Russian Recipes Revisited series. My friend Mary (aka arugula files) dared me (forced me?) gave me an assignment to post a Russian recipe once a month for twelve months. Since Mary has rarely steered me wrong, I will give it a try! Takes about an hour from beginning till the end. 1. In a large soup pot, combine the water, season it with salt and add the bay leaves. Add potatoes and cook until they have soften slightly (about 15 minutes). Add cabbage and cook for another 5-10 minutes. 2. Meanwhile, heat the oil in a large skillet. 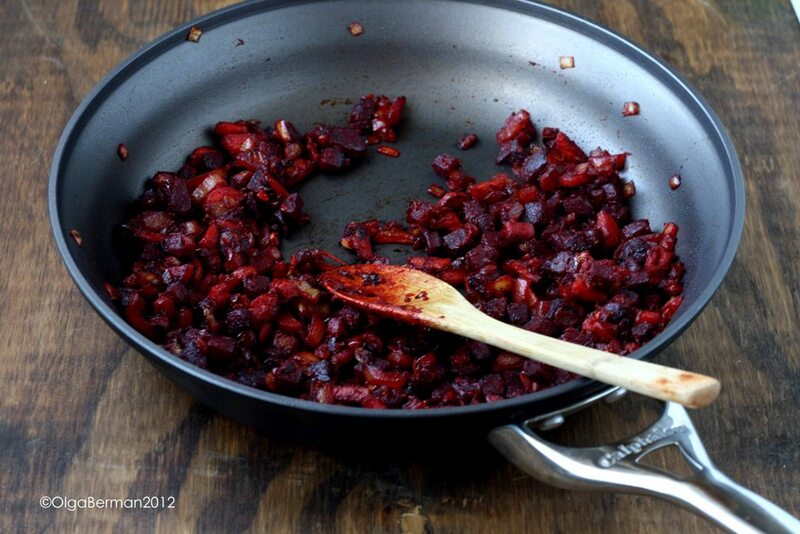 Add carrots and cubed beets and saute for 5 minutes. 3. Add the onions and garlic, season with salt and pepper and saute for 10 more minutes. 4. Add the tomato paste and let it cook with the vegetables for 5 minutes. 5. Now it's time to put everything together: Once the potatoes and cabbage are tender, add in the cooked beets/carrots/onions/garlic. Allow the soup to come to a boil. 6. 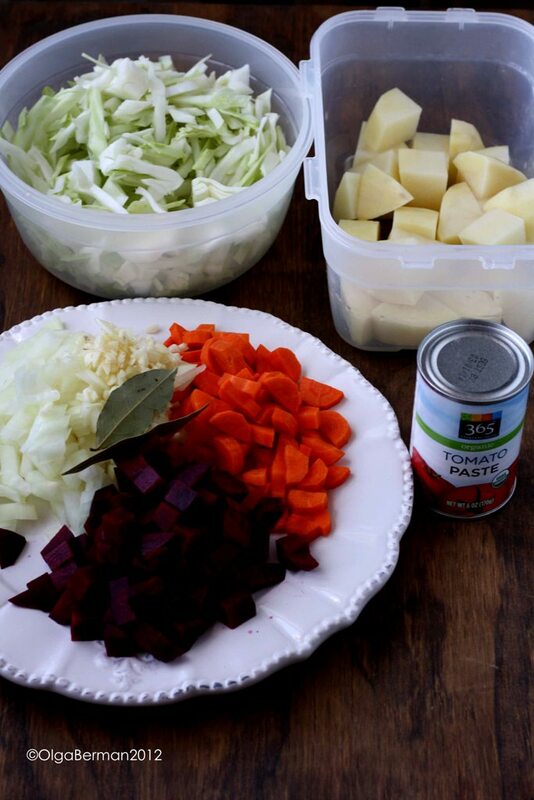 Add the grated beets and bring the soup back to a boil. The raw beets will intensify the color and flavor. 7. At this point, you can add a bit of sugar and/or lemon juice, depending on your taste. I didn't add either. Or top it with both dill and sour cream. You can also use Greek yogurt, mayonnaise or even a bit of buttermilk. Not a fan of dill? Add parsley! How pretty does this look?? Just like any soups, this one will get even better as it sits in the refrigerator overnight. 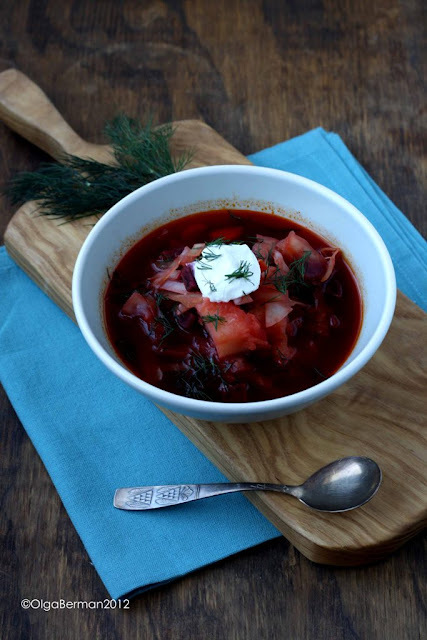 Check out this link Russian Recipes Revisited for Russian recipes I've already blogged about and let me know if you have any specific ones you'd like me to feature! I'm so excited about Russian Recipes Revisisted! Can't wait to see more. I'm so glad you are excited!!! 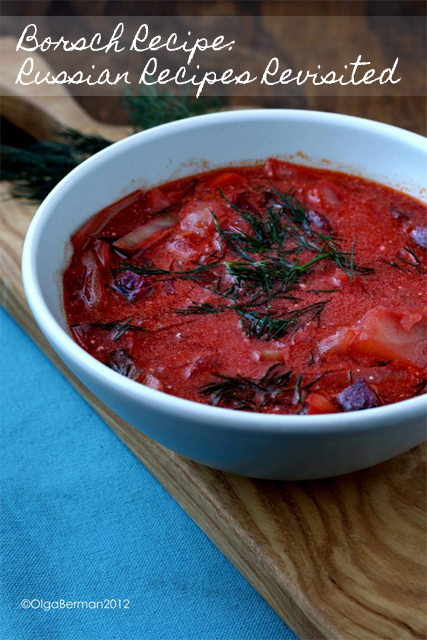 If you click on the words Russian Recipes Revisited in the post write up, you'll see all the other Russian recipes I've blogged about so far. It now has it's own label/category. If you have any requests, let me know! Where's the picture of your Dad? The internets demands it. I can't wait to hear about how to make beef stroganov. Mushroom recipes would be awesome. Mushroom soup, mushroom salad, marinated mushrooms, anything else you can think of. I grew up knowing this as a Lithuanian dish... with a t. :) It would be smooth with sour cream on top. I may need to try this version.